A pressure washer is a great tool to remove caked on grease and dirt. Taking off all of the layers of paint will insure that there is nothing hidden. About the only downside to sand blasting is the resulting mess. We did ours outside on the lawn, where some sand won’t really matter. Our Tiger project is now blasting (a bit of a pun intended) along at full speed. Over the Christmas holidays the front and rear suspension along with the last few bits were removed and with the use of our Rotary lift, the whole body was hoisted up so that it could be attached to a rotisserie we borrowed from a coworker. What a great tool. This sure made sanding, blasting and inspecting much easier than crawling around underneath the car. We looked into chemical stripping, but didn’t like the price, the fear that paint wouldn’t adhere properly and most importantly the six month wait time we were quoted. With the help of Casey, a local body work student off for the holidays and looking for some extra Christmas jingle, we got the whole Tiger sanded and stripped down. Outer panels were sanded with 40 to 80 grit dry paper. Tough crevices were sand blasted with a spot sand blaster. You need to be real careful on flat external panels, as sand blasting can quickly ruin your classic. 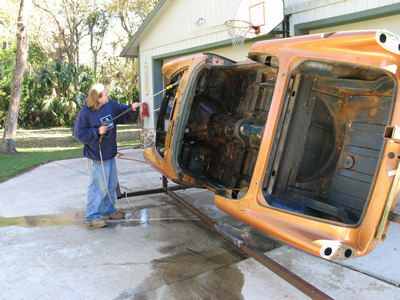 We then primed the entire car with PPG DP40 primer which fights off rust. Speaking of rust, we were pleased, or perhaps even ecstatic, to find virtually no rust anywhere on our Tiger. Between the rust free body and the escalating Tiger prices, the $8000 we paid for the car two years ago seemed like a lot of money, now seems like the deal of the decade. Look for articles to start shortly on this car.